Fabio Aru won his second stage in as many days at Sestriere, but the real story came in Alberto Contador‘s struggle behind. The Spaniard was dropped on the Colle delle Finestre, though successfully limited his losses to maintain his position atop the general classification. As is often the case with spectacular stages, today was peppered by poor performances and tactical blunders and, despite Fabio Aru’s win, even Astana may well be kicking themselves for failing to have made the most of Alberto Contador’s (Tinkoff-Saxo) jour sans. As a result, I’m going to give today’s rider of the day prize to one rider who certainly did as much as he could on a brutal day: Ryder Hesjedal (Cannondale-Garmin), who followed up yesterday’s second place with another. He’s really come into form into the final week of this race, and animated today’s stage with some wonderfully aggressive racing. He’s now set to finish fifth overall, edging out the likes of Leopold Konig (Sky) and Steven Kruijswijk (LottoNL-Jumbo). Chapeau, Ryder. 1. Contador measured his efforts excellently. When Contador was dropped on the Colle delle Finestre with not an ally in sight, it would’ve been easy for him to panic. However, El Pistolero kept his cool and managed to ride almost the final 40km with no assistance, eventually losing just over a couple of minutes to Aru. It was an impressively measured performance, though one that will also no doubt be subject to plenty of analysis in the Tinkoff camp over the coming weeks. There was no way that Contador should have been isolated for so long over any terrain, never mind on a gravel road on which punctures and crashes looked inevitable. If he had needed assistance, he’d have been waiting a terminally long time for it to arrive. 2. Astana were wasteful with their riders. Throughout this race Astana have grappled with the age-old problem of what to do when you’ve got a couple of very strong riders vying for the leadership role, and have never quite fathomed it. Had Aru worked in tandem with Mikel Landa (Astana) today, they could have really threatened to seize the maglia rosa. Instead, Landa was allowed to burn himself out on the Finestre, rendering himself pretty much useless when the gap to Contador had stabilised on the climb up to Sestriere. Four stage wins and second overall isn’t a bad return, but Astana may well look back on this race wondering if they could have done more. 3. What a climb! 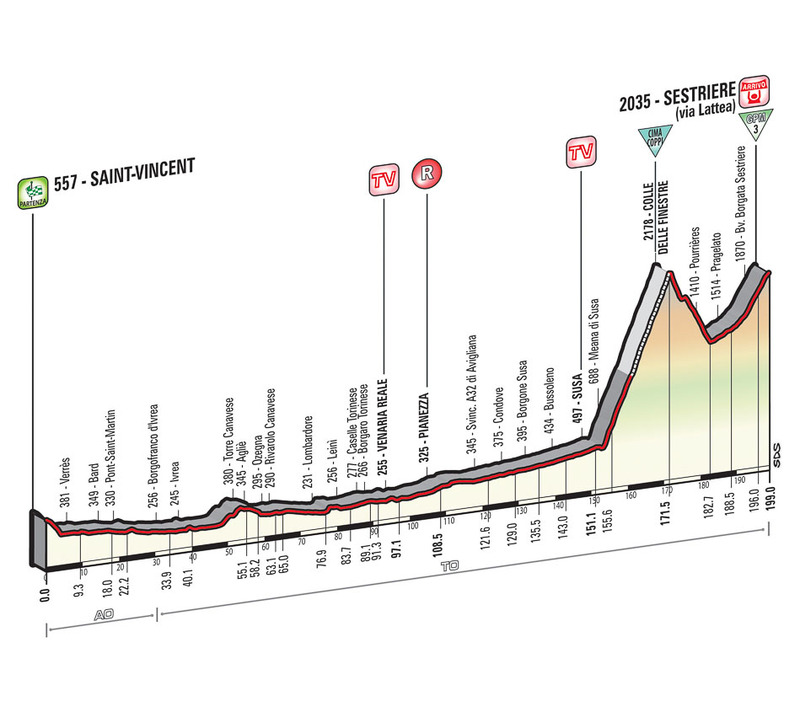 The dusty Colle delle Finestre has only been in the Giro d’Italia twice before today, though one suspects it may well feature a little more regularly after the reception it received this year. Not only is it very long and very steep, but its second half is made up entirely of gravel roads built to service military fortresses centuries ago. The riders doubtless hate having to tightrope-walk their way across a surface more suited to northern France than northern Italy, but for the viewer at home, the tension just adds to the spectacle. During the stage journalist Daniel Friebe declared it the greatest climb in professional cycling and we should see more of it. Points leader: Giacomo Nizzolo (Trek). King of the Mountains leader: Giovanni Visconti (Movistar). Best young rider: Fabio Aru (Astana).